We have a lot of fun at Mystery Playground - cooking up mysterious crafts, reading and reviewing novels, mixing drinks and matching them with books but it truly takes a team to get this done every day. First of all, I couldn't get this done without my partner in crime, the fabulous Kerry Hammond. Not only is she great at reviewing books, she's fun at parties AND an amazing friend. I'd like to thank Dee Dee Roe for all of her help in wrangling our Major Crimes coverage. Thanks to her I was able to interview so many wonderful people from the show this year, including: Kearran Giovanni (Detective Amy Sykes), Tony Denison (Lt. Andy Flynn), Phillip Keene (Buzz), Michael Paul Chan (Lt. Mike Tao), Director Stacey K. Black, Ransford Doherty (CI Kendall), and Costume Designer Greg Lavoi. Next up I'd like to thank the Silicon Valley based crafty crew - Janet Kuchler and Pat Hernas. These two put up with a lot of crazy craft ideas, and what you guys don't see is the crafts that fail... Yes, we have those too and sometimes it takes several tries to get something right. Sharon Long, reviewer extraordinaire, also deserves a big thank you! It's so much easier to just read a book, than review it. Sharon tackles each book with aplomb. Thanks Deb! We would not even have Mystery Playground and/or be able to continue without all of YOUR hard work, dedication and devotion!! 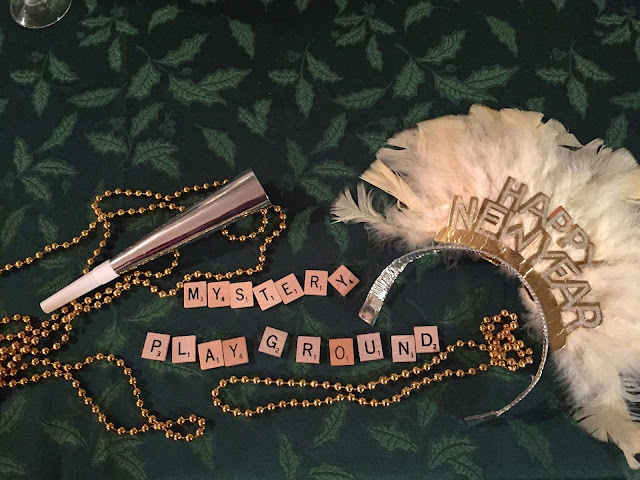 I'm looking forward to reading fabulous books and reviewing them on Mystery Playground in 2017! !